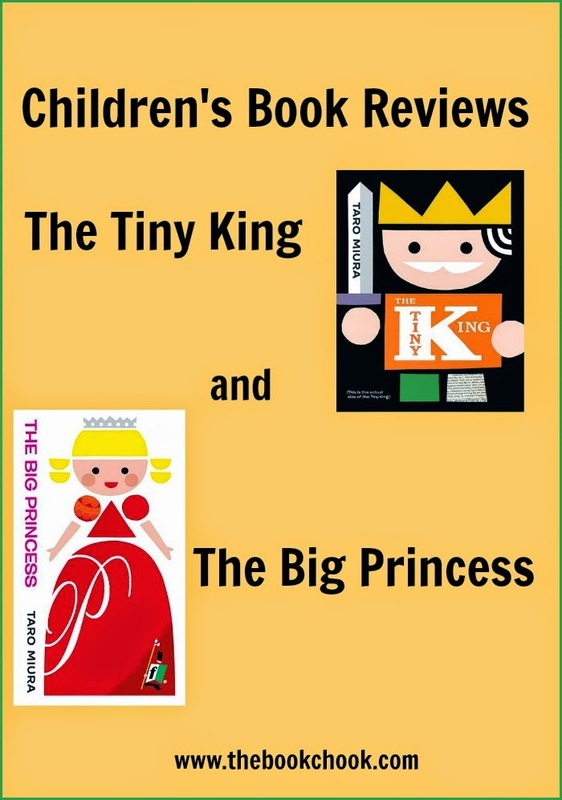 Because I love graphic design and creative artwork, I grabbed both The Tiny King and The Big Princess recently, hooked by the books' covers and the publisher’s descriptions. What a treat was in store! The Tiny King is a children's picture book, written and illustrated by Taro Miura, and published by Walker Books, 2013. With bright, bold cut-outs and a whimsical use of collage, Japanese artist Taro Miura creates a witty, heart-warming story with huge appeal for readers big and small. A refreshingly modern fairy tale with broad appeal for both children and adults.The brightly coloured geometric shapes and the creative use of collage in the artwork will appeal to young children and design-loving adults alike. While I expected to love the illustrations in The Tiny King, I had no idea I would be so charmed by the story. It’s a simple one, revealing the sumptuousness, and the problems, in the little King’s life. Even though he’s surrounded by plus-sized luxury, he’s sad and lonely. And then one day he falls in love with the Big Princess, and suddenly, family and sharing changes everything for the King. His life is transformed by his wife and ten (!) children, the castle rings with laughter, and the King sends all of his soldiers home to be with their own families. There are lots of opportunities for giggles and delight in The Tiny King - ‘…bath time was a real riot!’ - and I am confident it will inspire children to explore making their own art with primary colours and simple geometric shapes. The Big Princess was also written and illustrated by Taro Miura and published by Walker Books, 2014. Once upon a time ... a king and queen discover among their flowers - perched on a dew-speckled leaf - the teensiest, tiniest princess. Such a charming, sweet little thing! They are instantly taken with her - she becomes the daughter they never had, the child they had always dreamed of. The Queen immediately sets about finding her a perfect-sized bed and only a tiny ring box will do. But, in no time at all, the princess grows too big for her miniature bed. In fact, with each passing day, the princess grows bigger and BIGGER. The Big Princess is actually the prequel to The Tiny King, but both can be read as stand-alone stories. This children's picture book is a little more like a traditional fairy tale than The Tiny King in that it has a slight dark element: a white bird appears to the king in his dreams and not only fore-tells the discovery of a child, but predicts doom for the kingdom if the king cannot break the spell binding this child. As the princess grows and grows and GROWS, tension rises and we wonder how it will all end. Kids will love the teeny tiny beds the princess uses while still small, and adore the fold-out spread of her sprouting out of the castle’s tallest tower. In this book, Miura again uses a stunning colour palette that reminds me of all that’s wondrous and playful about childhood. Do seek out The Tiny King and The Big Princess if you’re looking to add to your library or bookshelf resources on Fairy Tales. Adults will love the underlying message about acceptance of individual differences, and the joy of positive relationships. I can’t wait to share The Tiny King in particular with my Storytime group at my local library. I know my chicks will be totally absorbed by all the visual detail, the humour and above all, the many opportunities for counting!